I have come back from a wonderful festival experience with my family we all had a ball with our friends and the kids were in their element as there was so much for them to do and see. They even slept in the pushchairs all evening meaning I could drink and dance until 1am (this is unheard of!). I have some great new ideas; I was very taken with the amount of flags on the festival site and I am thinking up some designs based around these. Until they change from ideas to designs here are the photos instead…………..
How not to install sculpture on a windy seafront! 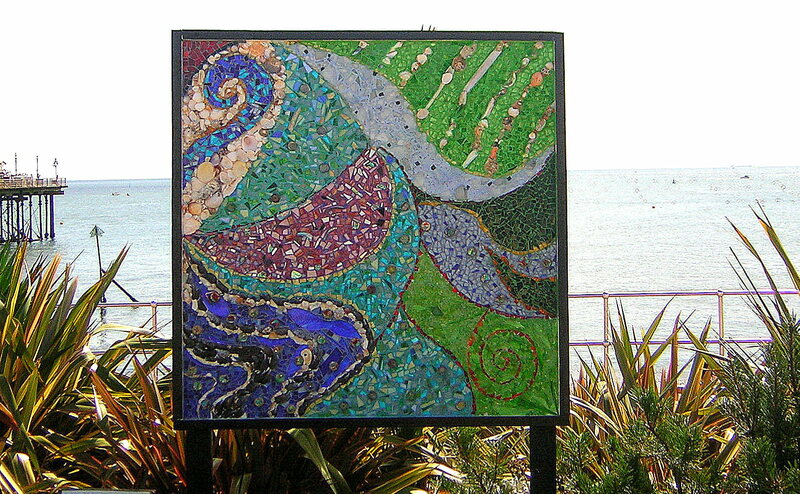 I have installed my mosaic on Teignmouth sea front (as part of the Trail outdoor art exhibition); having finally secured the 120cm square monster to the top of my car (with an old washing line) I had to drive through first very heavy rain, then hail and finally thick fog, before dodging the elderly pedestrians on the pedestrianised seafront. My long suffering husband and Liz the exhibition co-ordinator had to do most of the heavy work as I had both my babies with me, as the oldest was too ill to go to pre-school. Needless to say the baby cried throughout and my 3 year old was very vocally bored with the whole situation and quite poorly. I had to do a bit of touching up after we had bashed the hell out of it to get it securely in the ground, which gave me the unusual experience of being there when all the many passers by stopped to look at it. This was a much more pleasant experience than I was expecting and I had a good chat with lots of people, all of whom were positive about my work and the exhibition as a whole. One confused old gent wanted to know what I was putting up an advert for! I have been given an excellent spot right next to the pier and it can be seen from right the other side of the Den (big seaside park/green) and I think it looks fantastic with the sea behind it and hopefully when the sun is shining it will really sparkle and shimmer. However, the sun is not shining. 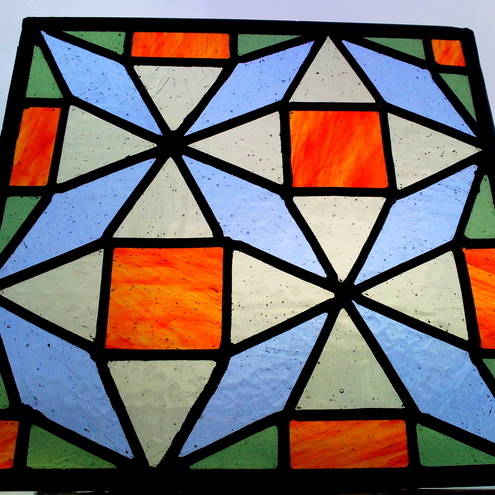 I woke up at 5 am to the sound of our bin being blown over in gale force winds and I had a classic anxiety dream about trying to catch all the tiles off my mosaic as they blew off the wind. I had to get my friend who lives nearby to go and check it was still standing. 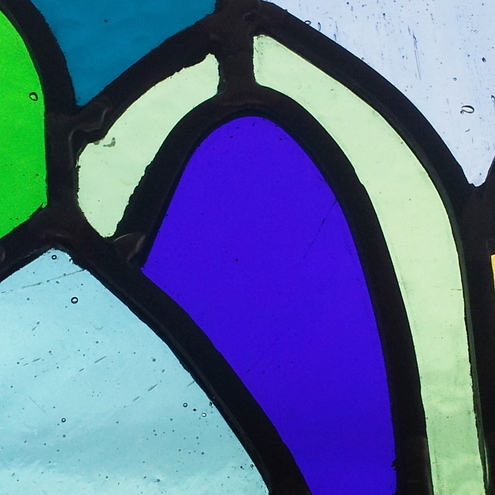 So far it is……….phew! The grand opening is on Monday 20th July at 11am, so if you are around, please come down the the Ness Hotel in Shaldon. Tomorrow my kids, man and I are all trundling down to the Isle of Wight for a fantastic sounding Yurt holiday. We will be back on 11th July. Since finishing my mosaic I am feeling a little flat creatively and I am taking my sketch pad with me on holiday in the hope that a change of scene will get the ideas flowing. 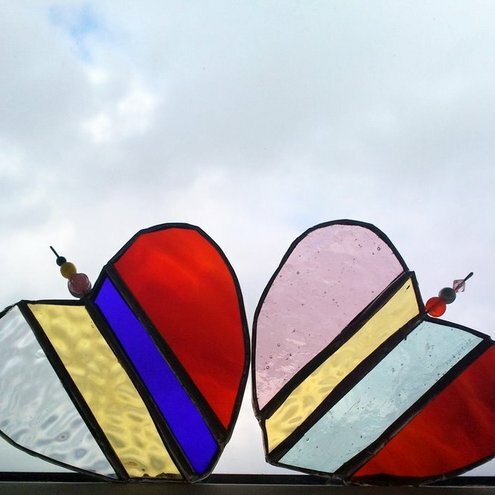 I am currently working a stained glass picture frame commission to match the wedding dress of the bride and my designs so far are not quite right…….hopefully a change of scene will make all the difference. 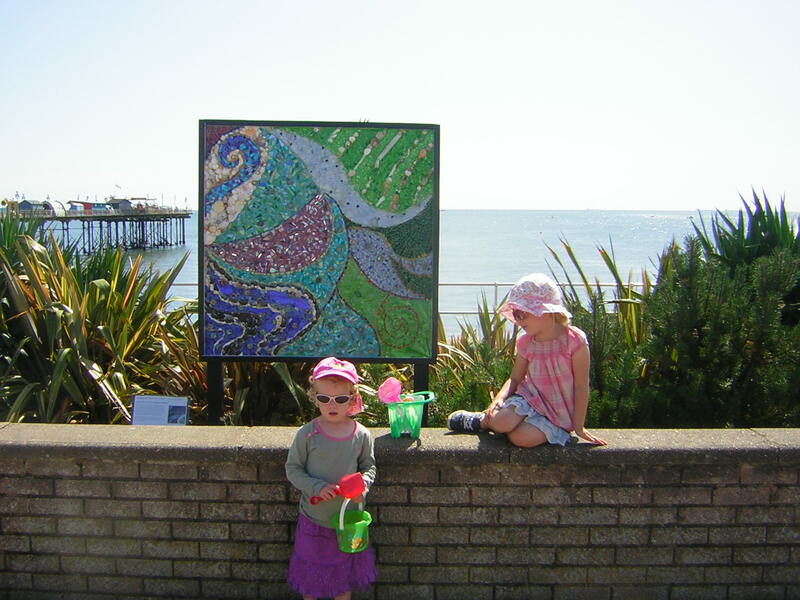 Its been hard for me to choose which colour to paint the frame my mosaic for the TRAIL exhibition; especially with a teething baby and a grumpy (cos its hot) 3 year old. However, having found some black paint in the shed the decision has been made for me! This paint would have otherwise sat there until it went crusty (too little left to do much with) so I am also keeping to the artist brief for recycled materials, yeah! Anyway, its all finished now and here it is……….. I have finally been gently guided to the world of blogging by my dear friends Maeve and Kim who helped with my website and feel I am finally embracing the naughties just before they end! 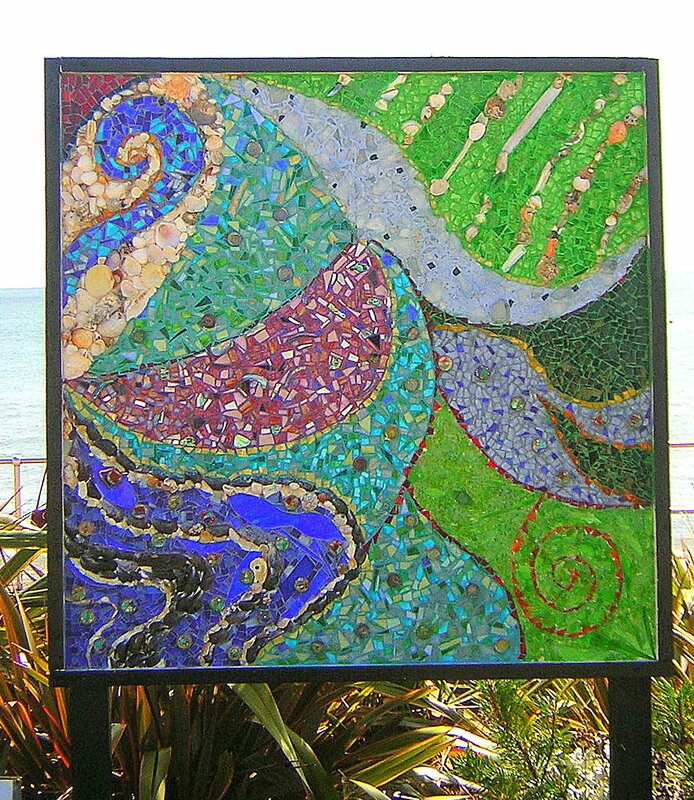 The TRAIL art exhibition in Teignmouth, Devon runs from the 20th July to 2nd September and I will be exhibiting a stained glass and recycled glass mosaic as part of this outdoor sculpture trail. 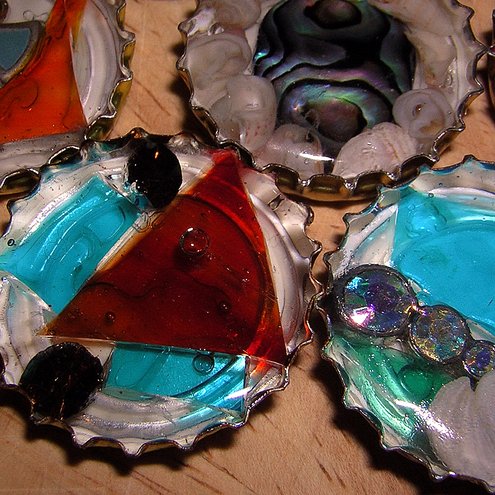 All of the exhibits will be made from atleast 70% recycled materials and have an environmental theme. I have chosen to abstract an image of a plankton bloom off the south west coast and have used entirely recylced glass, from RIO in Ottery St Mary and the waste glass from Glow Worm stained glass, Plymouth and from my own stained glass business. As well as shells and other found items. Mark, my fantastic husband has been brilliantly encouraging and looked after the kids loads whilst I fight against the tide of washing and small child mess to complete this and my fantastic friends at the Twisted Yarms knitting circle really gave me the confidence to do this after a long break from any formal artist activities and I can’t thank them enough.